What happens when you only need HALF of the onion? Several months ago I found a little gadget that I have to tell you about. 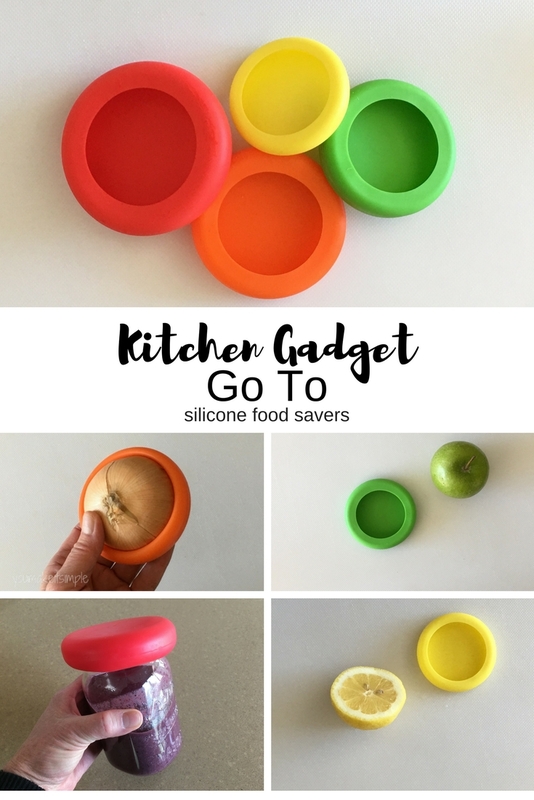 The KITCHEN GADGET GOTO this month is the silicone food savers. There are so many times when I am preparing food, that I only need half of whatever I am cutting up. Things like onions, lemons, pomegranate, grapefruit and apples often go to waste because a plastic bag covering them in the fridge just doesn’t’ cut it. Another thing these babies do, is keep the order down! When I put a half an onion in the fridge you don’t smell a thing. (Unlike the smell you get in a baggie. Even a ziplock bag it reeks). Drinking lemon water every morning is one of my healthy rituals that I SWEAR BY! I only use HALF A LEMON and I used to put either a plastic bag or plastic wrap around the other half. (What a waste)! The food saver is quick to put on and very easy to clean. They can be put in the dishwasher , microwave and freezers. Have leftover smoothie? No problem. These also work as great jar covers. As you can see, this set comes in FOUR bright colorful sizes. ORANGE – onions, apples, oranges, etc. GREEN – apples, small onions, etc. YELLOW – lemons, large limes, etc. These are definitely one of my favorite kitchen gadgets. They are way inexpensive, and easy to order. So if you waste a lot of produce because you only need half, give these colorful gems a whirl. I love them!